Picture 1: When the Soviet Union went to spread Communism in Afghanistan in 1979, they were hoping for a quick in-and-out. Based on complete and utter lack of perspective, Leonid Brezhnev sent in the troops to protect the socialist Afghan government and then demanded that Afghan leader Nur Muhammad Taraki secure the support of petite bourgeoisie, as per “manual of communist revolution”. The fact that there was no petite bourgeoisie in Afghanistan to begin with was a fact entirely lost on the Soviet leader. The rest, as they say, is history. Picture 2: Reacting to increasing Soviet in the country, the United States started arming, training and bankrolling anti-communist insurgents. After the Soviet Union fell apart and retreated from Afghanistan, the insurgents came to power and became known as the Taleban. The rest, as they say, is history. Picture 3: When Egypt’s Gamal Abdel Nasser decided to nationalise the Suez Canal, it prompted the military intervention of France and the United Kingdom who in cohort with Israel attacked Egypt and tried to topple Nasser’s regime. Officially, the pretext for Anglo-French intervention was Israeli invasion of Sinai Peninsula with France and UK deploying forces to “separate the warring sides”. The plan backfired as the US administration of President Eisenhower threatened to dump a whole lot of British sovereign bonds and send the value of the pound spiralling down. The British backed out of the action with the French following suit, both effectively relinquishing heavy-weight status on the world stage. The rest, as they say, is history. Picture 4: When Somalia disintegrated from within, the United Nations mandated a US led humanitarian intervention in an increasingly ugly civil war. Without trying to pick a side they tried to bring peace to a conflict they didn’t understand, let alone controlled. Applying tactics and politics which resembled trying to have the cake and eat it, the intervention, although initially moderately successful, failed spectacularly. The rest, as they say, is history. Picture 5: Three words. Bush, Iraq, WMDs. Nuff said. Picture 6: Interestingly, no-one is contemplating military intervention in Iran (at least since Bush is gone), despite the fact that it has a stronger and more united opposition than many of the countries of the “Jasmine revolution” as well as previous experience with democracy. Picture 7: Today, we have an US president who is desperately trying to wind up two ongoing wars, and embattled French president and a freshly minted UK prime minister, all of them with massive problems at home. 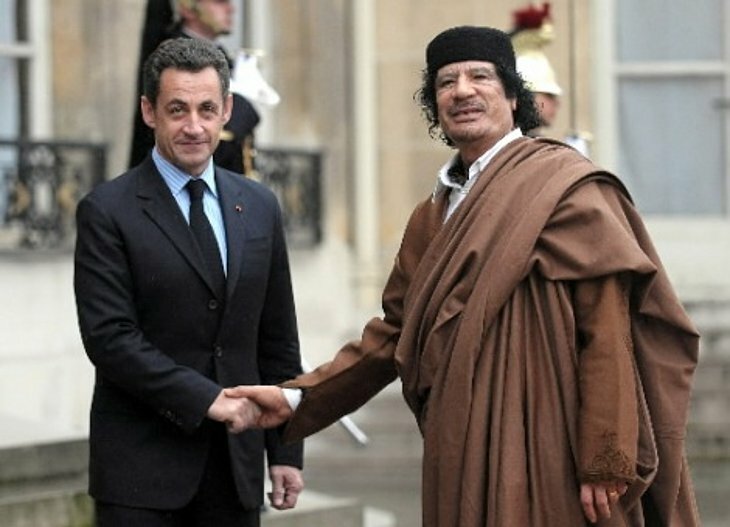 Then we have a North-African leader of questionable mental balance with whom the whole world was eager to shake hands with, as Libya was one of the few places where money could be made, corruption and human rights be damned. And then we have a hastily put together UN Security Council resolution authorising the first military action against a sovereign country since post 9/11 US invasion of Afghanistan and first “humanitarian intervention” since Kosovo in 1999. And let us not forget that for all intents and purposes, Libya still is a sovereign country with a legitimate (if dictatorial and unstable) leader. Seems to me that what we have here is an overzealous Sarkozy, a naive Cameron and a tired Obama, who is probably more than happy that someone else is taking the initiative. Problem is, it has been 55 years since France and the UK played a leading role in a real-life action flick. The other problem is, nobody really knows if the rebels really are “the good guys”. From what we know, they’re just “the other guys”. But if someone failed to land that lucrative deal, they quite possibly started to look a whole lot better than they may turn out to be. And all of a sudden the West will find itself in another war which will drag on and on….